It responds to the environment. It grows and develops and dies. It produces offspring. It maintains homeostasis. It has complex chemistry, and it consists of cells. It obtains and uses energy. The four unifying principles of biology are cell theory, gene theory, homeostasis and evolution. Homeostasis is the process of maintaining a stable internal environment. Breathing is an example of homeostasis. Every tree except the tree of the knowledge of good and evil. Satan fell because of his pride. The sugar was in the water. When the water was heated, more sugar was able to be dissolved. As the water cooled, it couldn’t hold the sugar anymore, and it reappeared, coming out of the water. The sugar is abiotic. It was not reproducing and dying. You are only seeing the sugar that was added into the water in the first place. Cells are the smallest unit of life capable of carrying out all the functions of living things. The small structures within cells are called organelles. Two types of reproduction are sexually and asexually. An organism needs a constant supply of energy and materials to carry out its essential processes to stay alive. Metabolism is the chemical processes that occur within a living organism in order to maintain life. Homeostasis is the process of maintaining a stable internal environment. 5. A natural study shows what actually occurs in nature. Therefore, it may provide a truer picture of what happens in the real world than an experiment does. A hypothesis is a possible explanation for a set of observations or an answer to a scientific problem that can be tested. The independent (manipulated) variable is the variable that is deliberately changed. Experiments should have only one variable is being tested. When all other variables are unchanged/controlled, we now the response (dependent/responding variable) is due to the one variable being changed. A controlled experiment will have an experimental group and a control group. The experimental group is the manipulated group to which the independent variable is applied. The control group is exposed to all the same conditions as the experimental group EXCEPT for the independent variable. This also supports that the response is due to the independent variable change. The dependent (responding) variable is the variable that is observed and that changes in response to the manipulated variable. This may vary some. You will need to determine if your experiment would adequately test the effect of water temperature on a fish’s breathing rate. Take temperature of water in fishbowl (without heat lamp applied). Record number of breaths/gill movements within a 30 sec-1 min time frame. Apply heat lamp to raise temperature. Record number of breaths/gill movements within same time intervals at higher temperature. Manipulated variable would be water temperature. Control would be the same fish. The manipulated variable would be the fuel brand. Same car, same distance and driving conditions. DNA has sections that signal for the beginning of a coding sequence as well as a DNA section that signals for the ending of a coding sequence. The possibility of damage to the DNA is minimized by having only small sections opened up at any time. Hummingbirds can beat their wings fast enough to hover in midair and they have long bills and tongues which allow them to drink from the nectar of flowers. The nervous system is a complex network of nervous tissue that carries electrical messages throughout the body. Skeletal muscle responds to nervous system signals and interacts with the skeleton to causes Voluntary muscle contraction. often pigmented. Chloroplasts are plastids. Cholesterol is the component of the cell membrane provides stability. Since oxygen is not very soluble in water (the major constituent of blood), an oxygen transport protein must be used to allow oxygen to be ‘soluble’. Hemoglobin (Hb) is the oxygen transport protein used in the blood of vertebrates. The peroxisome gets rid of toxic peroxides and digests fatty acids. The lysosome digest proteins (these can be membrane proteins i.e. receptors). The fungus just grows on its food. They secrete a wide range of extracellular enzymes into the environment to increase the availability of the nutrients they need (eg., ligninase, hemicellulase, amylase, chitinase, keratinase) which is how they contribute to nutrient recycling in nature. Secreted proteins are produced “in” the ER. When transcription is about to occur a ribosome interacts with the ER and “inserts” a protein in it. This protein is then transported through vesicular transport to the golgi for further processing. Soluble proteins of the cell are produced in the cytoplasm by free ribosomes. All the proteins are transported between organelles through membrane trafficking (vesicular transport) which involves the cytoskeleton (microtubules) as well as proteins that “carry” the vesicles along the microtubules. The double membrane structure of the mitochondria allows for the isolation of H+. Endocytosis. This is a very complex process involving receptors (receptor mediated endocytosis) the cytoskeleton as well as many proteins that “tag” the vesicles for transport to appropriate parts of the cell. Eukaryotic cells are cells that contain a nucleus. Eukaryotic cells have other organelles besides the nucleus. The only organelles in a prokaryotic cell are ribosomes and are found in multi-celled organisms. In vascular plants, stems are the organs that hold plants upright so they can get the sunlight and air they need. 1-All organisms are composed of cells. 2-Cells are alive and the basic living units of organization in all organisms. 3-All cells come from other cells. The process of diffusion is molecules are said to flow down their concentration gradient, flowing from an area of high concentration to an area of low concentration. It would be a hypertonic solution because with a hypertonic solution means the environment outside of the cell has more dissolved material than inside of the cell. If a cell is placed in a hypertonic solution, water will leave the cell. This can cause a cell to shrink and shrivel. When celery is placed in tap water (hypotonic), the water will flow into the celery, making it swell. When celery is placed in sugar water (hypertonic), water will flow out of the celery into the sugar water, making the celery shrivel. Water will flow from the 85% water cell into the 70% water solution (shown). Water will flow from the 2% salt cell into the 25% salt solution. Water will flow from the 90% water solution into the 14% salt (86% water) cell. Water will flow from the 2% NaCl (98% water) cell into the 10% glucose (90% water) solution. 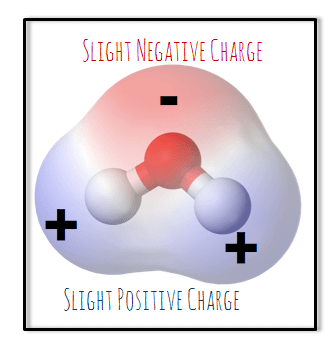 Water is polar because the charges are unevenly distributed with negative charges on the oxygen end of the molecule and positive charges on the hydrogen end of the molecule. The polarity of individual water molecules causes opposite ends to attract each other like magnets. False – A hydrogen bond is stronger than an ionic bond. 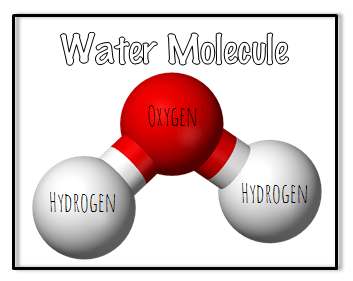 True – The attraction between the hydrogen atom on one water molecule and the oxygen atom on another water molecule is an example. False – A hydrogen bond is stronger than a covalent bond. False – They are the strongest bonds that form between molecules. Cohesion is the attraction of like molecules. Adhesion is the attraction of unlike molecules. Capillary action makes it possible for water to flow up plant tubules from roots to leaves (against gravity). Water’s polarity gives it the ability to fit between the atoms of other polar or ionic substances, dissolving them. In a sugar-water solution, water is the solvent and sugar is the solute. Solid water is less dense than liquid water, so ice floats in water. When ice forms at the top of a body of water, it insulates organisms at the lower levels. Water’s high specific heat means that it is slow to change temperature. This allows large bodies of water to maintain a relatively stable temperature, protecting the organisms living in them from severe temperature changes and regulating temperatures of nearby landmasses. It also helps maintain stable body temperature. Water has an equal amount of H+ and OH– ions, making it neutral. The pH scale indicates the concentration of hydrogen and hydroxide ions in solutions. Changes in pH can disrupt cells’ chemical reactions and homeostasis. Buffers are weak acids and weak bases that work to neutralize stronger acids and bases. All organic chemical compounds possess one thing in common; all of them contain the element is Carbon. The Carbohydrates are made up of three different elements in a ratio of 1:2:1. In order, these elements are its carbon, hydrogen, and oxygen. A simple sugar called_Glucose_, whose chemical formula is C6H12O6 is broken down during glycolysis. Anabolism is the process of building up larger molecules from smaller ones. Anabolism is a metabolic function. The three elements make up lipids are carbon, hydrogen, and oxygen. Energy is stored in the chemical bonds of lipids. Proteins are made up of chains of simple molecules called Amino Acids. Nucleic Acids are made up of chains of simple molecules called Nucleic Acids. cohesion: the attraction of like molecules such as the attraction of water molecules to each other. The purpose of cellular respiration in plants and animals is to break down sugar from food (glucose) and turn it into energy. Cellular respiration takes place in the cytoplasm and mitochondria of cells. Carbon dioxide is the waste produce of cellular respiration. a) Photosynthesis takes place in the chloroplasts. Cellular respiration takes place in the cytoplasm and mitochondria. b) The waste product of photosynthesis is oxygen. The waste product of photosynthesis is carbon dioxide. c) Carbon dioxide and water are required for photosynthesis. Glucose and oxygen are required for cellular respiration. d) Electron transport chains are used for creating energy (ATP). e) ATPase drives the synthesis of ATP. The inner compartments inside the thylakoids are called the thylakoid space (or lumen). This is the site of the first part of photosynthesis. The interior space that surrounds the thylakoids is filled with a fluid called stroma. This is where carbon dioxide is used to produce glucose, the second part of photosynthesis. If the stomata of a plant leaf were glued shut Carbon Dioxide would not be able to enter the leaf. Carbon Dioxide is one of three reactants needed to begin the photosynthesis process. The reactants of photosynthesis are carbon dioxide and water. The products of photosynthesis are glucose and oxygen. Chloroplasts, the organelles which conduct photosynthesis in plants and algae. Each chloroplast contains neat stacks called grana (singular, granum). The grana consist of sac-like membranes, known as thylakoid membranes. These membranes contain photosystems, which are groups of molecules that include chlorophyll, a green pigment. The light reactions of photosynthesis occur in the thylakoid membranes. The stroma is the space outside the thylakoid membranes, as shown in Figure below. In addition to enzymes, two basic types of molecules-pigments and electron carriers–are key players in this process. This is where the reactions of the Calvin cycle take place. Electron Carrier is a molecule which transfers energy-carrying electrons within an electron transport chain. Electron Transport Chain (ETC) is a A series of electron-carrying molecules which accept and pass along energy-carrying electrons in small steps, allowing the energy lost at each transfer to be captured for storage or work. Cellular respiration is a cellular process that requires oxygen and gives off carbon dioxide in order to obtain energy for the organism. Fermentation is the process that releases energy from food molecules by producing ATP in the absence of oxygen. Alcohol fermentation is a process that uses yeast and bacteria. They work together to convert sugars into ethyl alcohol and carbon dioxide. The fermentation begins after glucose enters the cells and broken down into pyruvic acid. The pyruvic acid is then turned into CO2, ethanol, and energy. They use up the ATP produced by cellular respiration; they produce it by lactic acid fermentation. Because they are using oxygen at a rate faster than the lungs and heart are able to match. This activity is known as “anaerobic” (without oxygen). Muscles are designed to work this way for extreme bursts of power and speed. But oxygen is ultimately required to make the body work, so after the race, you must replenish the oxygen within the body. Photosynthesis removes carbon dioxide from the air and cellular respiration puts it back. Photosynthesis releases oxygen into the atmosphere and cellular respiration uses the oxygen to release energy from food. ATP is adenosine triphosphate. This chemical compound is what living things use to store energy ADP stored in the body so when it’s time to use that stored energy, ADP goes through ATP synthesis to make ATP and use that energy though the body. ATP (adenine triphosphate) is the compound responsible for providing energy to a cell to carry out its metabolic process. When the ATP molecule is in contact with a water molecule (hydrolysis), the result is ADP (adenosine diphosphate) and a phosphate. In this reaction, energy is released to the cell. The ADP molecule is further broken down to AMP (adenosine monophosphate) and a phosphate through hydrolysis, releasing further chemical energy. Cells create and store energy in different ways. Cells are able to store small amounts of energy through a molecule called adenosine triphosphate. ATP is a kind of chemical substance in living organisms. It stores energy in its phosphate bonds. When these phosphate bonds are broken, energy is released that is made available for biological processes. Six molecules of watertext annotation indicator plus six molecules of carbon dioxide text annotation indicator produce one molecule of sugar (called glucose text annotation indicator) plus six molecules of oxygen. A stacked membranous structure within a chloroplast that contains the chlorophyll and is the site of the light reactions of photosynthesis. binary fission, fragmentation, and budding. A gamete is haploid, meaning that it contains only 1 complete set of chromosomes. Therefore, a gamete has only 1 allele for each gene. A zygote is the single cell that forms after sperm fertilizes an egg cell. A zygote is a diploid cell, formed from the union of two haploid cells. Gamates have half the number of chromosomes from each parent cell. That is 23 from father and 23 from mother, which makes 23 pairs in the daughter cell. A normal human zygote has 46 chromosomes. 23 from each of the parents. Give at least one thing they have in common and one way that they are different. They code for varying alleles for the same traits, one from each parent. a, 2N – Why? It is because diploid cells have 2 sets of chromosomes, designated 2N. b, 4 – Haploid is one-half of the diploid number. Meiosis divides chromosome number and reduces it by half. The two stages are Meiosis I and Meiosis II. True! Meiosis results in four haploid cells. Homologous chromosomes move together and attach at their centromeres. c, 4 – Each chromosome is two chromatids and a tetrad is composed of two chromosomes. Crossing over exchanges alleles and allows for genetic variation in offspring. Haploid gametes produced in males – sperm. Haploid gametes produced in females ova. Cells that do not participate in reproduction that are produced in females – polar bodies. mRNA carries the instructions from the nucleus to the cytoplasm. Both DNA and RNA contain nucleotides which contain a sugar, (deoxyribose in DNA and ribose in RNA), and a phosphate group. The DNA strand consists of two strands of nucleotide bases while the RNA strand contains one. Because the RNA structure only has one strand, the RNA cannot form a double helix structure like the DNA molecule. Also, the RNA strand switches uracil for thymine in the nucleotide chain. RNA has ribose sugar instead of deoxyribose. RNA is generally single-stranded, instead of double-stranded. RNA contains uracil in place of thymine. The genetic code is read 3 letters at a time, so that each “word” of the coded message is three bases long. The cell uses information from the messenger RNA to produce proteins. a permanent change in the DNA sequence of a gene. For thousands of years ancient farmers used basic genetic principles when they attempted to improve food plants by saving the larger seeds from grasses and breeding them with other larger seeds. Humans have captured wild animals and bred them together to make bigger sheep with thicker wool, chickens that grew larger eggs and horses that were faster and more powerful. Mendel is often called the father of genetics for his study of the inheritance of traits in pea plants. He wanted to learn what would happen when two pea plants with different easily distinguishable traits were bred together. A Punnett Square displays all the possible outcomes of a genetic cross. Genes are located on DNA strands which make up the chromosomes. Diploid refers to the dual nature of chromosomes. Bacteria are tiny, one-celled creatures that get nutrients from their environments in order to live. In some cases that environment is a human body. Bacteria can reproduce outside of the body or within the body as they cause infections. Some infections bacteria cause include sore throats (tonsillitis or strep throat), ear infections, cavities, and pneumonia. Viruses need to be inside living cells to grow and reproduce. Most viruses can’t survive very long if they’re not inside a living thing like a plant, animal, or person. Whatever a virus lives in is called its host. When viruses get inside people’s bodies, they can spread and make people sick. Viruses cause chickenpox, measles, flu, and many other diseases. Fungi are multi-celled, plant-like organisms. Unlike other plants, fungi cannot make their own food from soil, water, and air. Instead, fungi get their nutrition from plants, people, and animals. They love to live in damp, warm places, and many fungi are not dangerous in healthy people. An example of something caused by fungi is athlete’s foot, that itchy rash that teens and adults sometimes get between their toes. Hand washing. Cover your nose and mouth when you sneeze and cough, if you have to cough, it is best to do it in your elbow. Using tissues for your sneezes. All we have to do is touch something that is infected, then touch food that is placed into our mouths … bingo …infected with germs. Germs can also enter the body through cuts, by breathing, or by food that has bacteria. Routine immunizations from your doctor staying Healthy by eating well, exercising regularly, and getting good sleep. Your Bed Sheets, It’s a good idea to change your sheets about once a week. Wash them in warm or hot water with a regular detergent. Bleach or a bleach-alternative is also a good way to keep them sanitized. Your Toothbrush, replace your toothbrush every 3 months and do not share it with anyone. Your Makeup, replacing your powders and eye shadows every two years, foundation every year, and mascara every three months. Wash any applicators frequently with regular soap and water, and wipe your brushes with alcohol. Finally, do not share your makeup with others. Your Kitchen Sink, cleaning your kitchen sink is to use a bleach-based cleaner after use. The Kitchen Sponge, Disinfecting and cleaning a sponge is easy. Toss it in the dishwasher, or wet and microwave it for 1-2 minutes. Your Purse, do not put it on the floor of any public place, such as the train, bus, or public restroom. Wipe it down every day with an alcohol-based sanitizer. Washing your feet every day, Drying your feet completely, especially between your toes, Wearing sandals or shower shoes when walking around in locker rooms, public pools, and public showers, Wearing clean socks. If they get wet or damp, be sure to change them as soon as you can, using a medicated powder on your feet to help reduce perspiration, You can ditch jock itch by: Wearing clean, cotton underwear and loose-fitting pants. Keeping your groin area clean and dry. Changing out of wet swimsuits instead of lounging around in them, Wearing clean, cotton underpants. Protozoan Diseases: Protozoans are a group of eukaryotic single-celled organisms. Several species of protozoans infect humans and inhabit the body as commensals or parasites. The parasitic protozoans of major medical importance include certain species of amoebae, flagellates, and sporozoans. Amoebae-The most notorious amoeba of humans is Entamoeba histolytica, an inhabitant of the large intestine. Although often harmless, it can become invasive, penetrating into the mucous membrane of the intestine, multiplying and eroding the tissue. The result is a disease called amebiasis, characterized by intense abdominal pain, blood and mucus in the stool, diarrhea, and dehydration (a syndrome called amebic dysentery). Amebiasis can be fatal, especially to infants and children. In addition to the intestinal infection, the amoebae sometimes get into the bloodstream and establish secondary sites of infection in the liver, brain, or elsewhere. Entamoeba histolytica is acquired from food or water contaminated with sewage. Several other amoebae, such as Entamoeba coli, inhabit the human intestine with little or no harm to the host, but their presence indicates that the person has ingested food or water contaminated with human feces and may be at risk of more serious infections. Flagellates-The world’s most common cause of water-borne diarrhea is the flagellate Giardia lamblia. Outbreaks of giardiasis are common in schools, mental hospitals, prisons, and other crowded institutions, but occur in circumstances as diverse as luxury resorts, backcountry camping, and impoverished villages. Giardia attaches to the surface of the small intestine, often in numbers great enough to seriously interfere with nutrient absorption. Unabsorbed nutrients then pass to the large intestine and cause gas production, painful abdominal cramps, and diarrhea. Since 1900 about 1,000 people in the United States have been killed by the poison. People did not have to move every time the climate changed because they were able to be persevered, make is stay fresh longer. These bacteria can only grow in the absence of oxygen. Another condition that is needed for this bacterium to grow is a medium (environment) that is not too acidic. Anaerobic bacteria generally cannot grow inside people because the blood carries oxygen to every nook and cranny of a person’s body. When conditions are not right for growth, these bacteria form spores (a kind of safe, sleeping state). C. botulinum spores have very thick walls that are extremely heat-resistant. No drug is available to reverse the paralyzing process of botulinum poisoning. But it can reverse with time, by placing victims in artificial respirators—machines that can keep the victims breathing. You are safe provided you boil the food for a few minutes. Botulinum poison is a protein. And like most proteins, it is easily destroyed or inactivated by heating. You can become paralyzed and, possibly, even die. Unusual odors, swollen cans, leaking cans, or bad-tasting foods. Time can be bought, for example, by placing victims in artificial respirators—machines that can keep the victims breathing. Patients whose swallowing muscles are paralyzed can be fed through their veins. If botulism is found a Class I recall will be ordered by the FDA. That means all the products that of the food that contained botulism will be ordered off the shelves of every store in the U.S. Animals with vertebrates are in Kingdom Animalia, and Phylum Chordata. The five classes of vertebrae are fish, amphibians, reptiles, birds and mammals. The first vertebrate’s lampreys and hagfishes. These fishes had thick, bony shields that encased the head and part of the trunk, while the rear of the body and the tail were protected by large scales. Evidence of vertebrae is found as indentations on the inner surface of the fossilized head shield. Jaws and paired fins (corresponding to human arms and legs) were absent, and these fishes must have spent much of their life lying on the sea bed, ingesting mud and straining out tiny food particles. Hagfish feed on the blood and body fluids of a host fish by attaching to the side of the fish and creating a hole with their rasp-like tongue. They have: parasitic lifestyle, mucous covered skin, fins are not paired, no swim bladder, gills for breathing, two chambered heart, blood pumped in one direction, back through gills, ectotherm-body temperature depends on environment. Agnatha are jawless fish. Lampreys and hagfish are in this class. Members of the agnatha class are probably the earliest vertebrates. Placoderms were among the first jawed fish; their jaws likely evolved from the first of their gill arches. Their head and thorax were covered by articulated armored plates and the rest of the body was scaled or naked, depending on the species. The vast majority of placoderms were predators, many of which were bottom dwellers. The class is divided into two subclasses: Elasmobranchii (sharks, rays and skates) and Holocephali (chimaeras, sometimes called ghost sharks, which are sometimes separated into their own class). Sharks, rays, and skates are in the class Chondrichthyes, they all have: free-living, carnivores, tooth like scales, paired fins, large, oily liver » buoyant, gills for breathing, two chambered heart, blood pumped in one direction, back through gills, ectotherm-body temperature depends on environment eggs are fertilized internally and left outside the body to develop; exception: Great White sharks carry their young inside during development-the larger offspring may eat their smaller siblings while still inside the mother. Rays and skates are dorsoventrally flattened fish that are closely related to sharks. All are considered to be within a closely related group of fish called elasmobranchs. Rays belong to three scientific orders-Pristiformes, Myliobatiformes, and Torpediniformes while skates are classified in the order Rajiformes. RAYS are a type of flattened fish and are closely related to sharks. Rays evolved from sharks. Unlike other fish, rays and sharks have no bones; their skeleton is made of cartilage, which is a tough, fibrous substance, not nearly as hard as bone. Many rays have spines on their tail which can poison other animals when stung. Some rays have long, whip-like tails, other species have short tails. Some rays have a series of thorns on their body as a defense against predators. The color variation among rays is huge; color even varies from male to female in some species. Rays have a flattened body shape and an elongated tail. The pectoral fins are large and connected to the body to form the ray’s “disc.” The shape of the disc differs from species to species and may be circular, oval, wedge-shaped or triangular. Some body shapes are adapted for living on the seabed; others are adapted for almost constant swimming. The ray’s distinctive tail also varies from species to species. It ranges from stubby (on the Shorttailed electric rays) to incredibly long (e.g., over 10 feet (3 m) long on the Whip-like sting rays). Coelocanths and rhipidistians–muscular pectoral and pelvic fins. Can “walk” on fins. Only 1 extant species, acoelacanth. Snakes, lizards, turtles, and alligators represent the Reptiles. Chelonia–turtles, Squamata–lizards and snakes, Crocodilia–alligators and crocodiles. Ectotherm-body temperature depends on environment, internal fertilization, amniotic eggs with leathery shells to prevent drying out on land, lungs for breathing, 3 chambered heart except for crocodilians with 4 chambered heart, skin, scales, claw and no metamorphosis. Snakes swallow their prey whole, since they have no limbs with which to dismember it and teeth adapted to gripping (or injecting venom, in the case of a venomous snake’s fangs), not chewing. Their lower jaw is connected to the upper by an elastic ligament, which allows the jaws to open very wide. The two halves of the lower jaw are not connected at the chin, so the jaws can also spread open sideways, and all the segments of the skull are only loosely connected to one another, and are able to move independently. Having killed its prey (either by suffocation, in the case of constrictors, or with venom in the case of venomous species), a snake will pull it into the mouth by hooking its sharp, backward-facing teeth into its victim and ‘walking’ its jaws over it. The skin and stomach are stretchy enough to allow the snake to ingest large prey items, and the glottis can protrude from the mouth so that it can continue breathing whilst its throat is full with the food being swallowed. Prey is usually swallowed head-first, so that the limbs, fur, feathers, etc. lie flat against the body and make the process easier. It’s a ‘sensory organ’. It basically takes the form of two ‘pockets’ in the roof of the snakes mouth. When the snake flicks out its tongue, microscopic scent particles stick to it. Withdrawing the tongue back into its mouth, the tips are inserted into the Jacobson’s organ, and the snake’s brain decodes the information. Turtles have a razor-sharp beak for eating. Depending on genus, the beak may be hook-like, scissor-like or serrated. Internal fertilization, eggs with calcified shell, lungs to breathe, 4 chambered heart; oxygenated blood from lungs pumped to body, back through heart to the lungs again, skin, scales, feathers, no metamorphosis. Warm-blooded–use their metabolic heat to maintain a constant body temp. They give birth to their young ones, They feed milk, They possess back bone, Their blood pigment is hemoglobin, They have closed circulatory system, Brain and spinal cord are well developed, Notochord is present.